George Samuel RAMSDALE was born on Thursday, 17 November 1859 at 2 Court, Great Russell Street, Birmingham, in the parish of St. George. 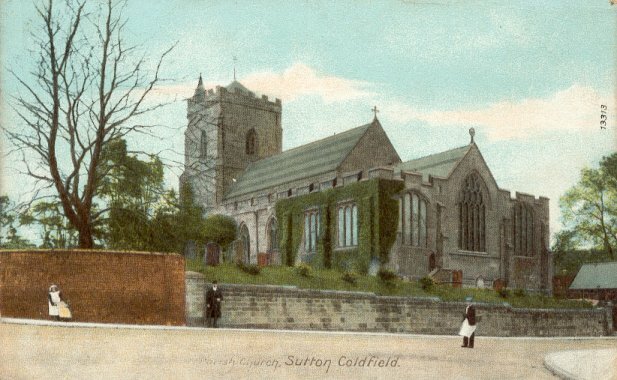 On Monday, 26 April 1886 he married Mary Ann HORTON (who was born on Saturday, 28 July 1860 at Myring Place, Sutton Coldfield and baptised on Sunday, 19 August 1860, the daughter of William HORTON and Caroline PERKS) in the parish church of Sutton Coldfield in Warwickshire after banns. At the time of their marriage in 1886, George Samuel RAMSDALE resided at Park Road, Soho, Birmingham and his rank or profession was described as "wire drawer". The rank or profession of George Samuel's father, Samuel RAMSDALE, was described as "Porter". 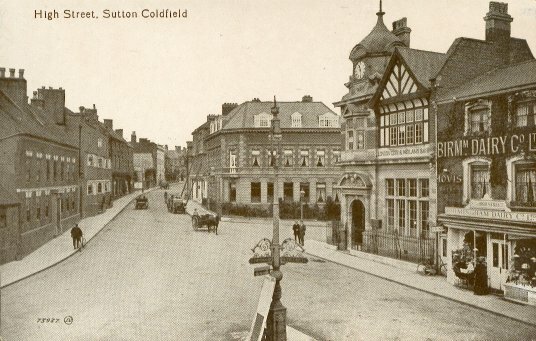 Mary Ann HORTON was described as a spinster age 25 without rank or profession residing in Sutton Coldfield whose father, William HORTON, was deceased (he had died in 1862). William and his daughter Mary Ann HORTON lived at Myring Place (grid reference SP137965) which was a hamlet on the south side of Rectory Road in Sutton Coldfield. It is now recalled in Myring Drive. 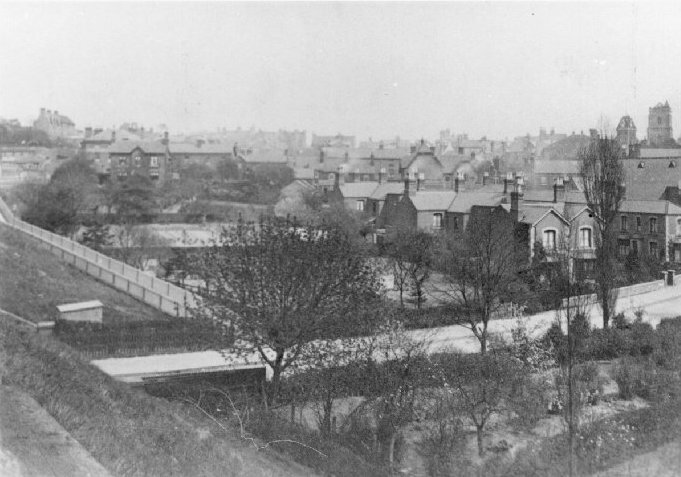 The modern road lies just west of the row of cottages which stood opposite Blakemore Drive. Note: No reference in this census return to William HORTON who would have been 9 years of age on Sunday, 6 June 1841 (the day of the 1841 census) having been born on Sunday, 6 May 1832. Thomas PERKS died on 24 June 1854 at Driffold Lunatic Asylum, Sutton Coldfield. The certified cause of death was "drowning whilst in a state of temporary insanity". His occupation at time of death was labourer. The informant was George Bodington, warden and coroner, Driffold Lunatic Asylum, Sutton Coldfield. Bodington Gardens, Birmingham Road, Maney commemorates the eminent Sutton Coldfield personage George Bodington. Born in Buckinghamshire in 1799 and educated at Magdalene College, Oxford George Bodington became a physician and GP in Erdington (parish of Aston) Warwickshire. He was also a local politician and served on the Sutton Corporation for forty years (having, as was customary, been appointed for life). His great professional interest was pulmonary disease and in 1836 he acquired the asylum and sanitorium at Driffold House, Maney (now the Empire cinema). He was a pioneer in his field and was the first to suggest dry frosty air as a cure for tuberculosis. He was not taken seriously by his contemporaries, lost interest in the subject and turned to the treatment of insanity. In 1851 the local census recorded eleven "lunatics" and six staff including the doctor and his family at Driffold House. Records show that the asylum held between 16 and 24 patients at a time, from 1845-1868. They were aged from 18 to 88 and most were female. Five who were noted in the 1851 census were still there a decade later. He died aged 83 in 1882 (cause of death tuberculosis). Note that Caroline Elizabeth HORTON was born almost five years after the death of William HORTON. The name of her father is omitted from the birth certificate which confirms her mother's name and maiden name as "Caroline Horton formerly Perks widow of William Horton, cordwainer journeyman". William HORTON died on Monday, 8 September 1862 "near the rectory" (from the parish burial record) at Myring Place, Sutton Coldfield [SP 13671 96499] adjacent to Church Grove Farm and opposite White House Farm (from the death certificate - but see below). William HORTON was described on his certificate of death as a "Cordwainer Journeyman", his cause of death was Phthisis, the old name for Tuberculosis of the lungs (from the Greek, phthinein, to waste away), a disease characterised by the wasting away or atrophy of the body or a part of the body. The informant was Jane PERKS (illiterate), possibly his sister-in-law (see 1841 census return above), who was present at the death at Whitehouse Common, Sutton Coldfield (grid reference SP 13632 97227), which name was in use by 1725 and may have referred to Whitehouse Farm [SP 13300 97763] (note the spelling) which stood on Whitehouse Common Road between Ashfurlong Crescent and the Tamworth Road. 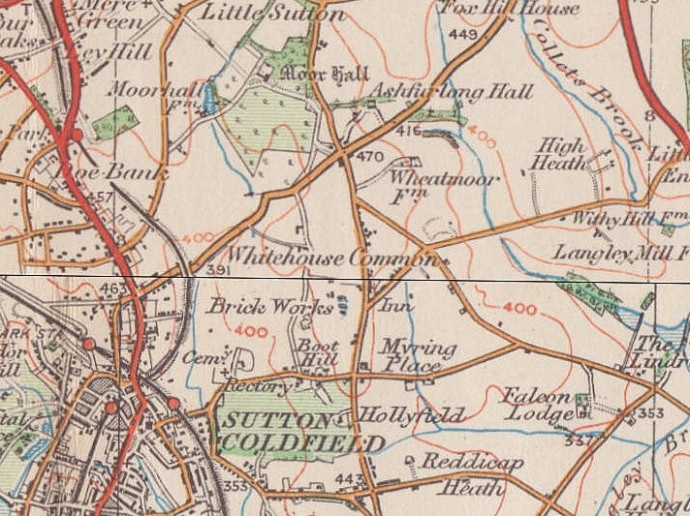 The area around Whitehouse Common Road covered by the modern district of Whitehouse Common was then known as Whitehouse Enclosure having been enclosed with the rest of Sutton Coldfield's common land in the 1820s. Kelly's Directory of Birmingham & Suburbs (1892) lists George RAMSDALE as being a shopkeeper at the 215 Icknield Street address, his neighbours being Henry HADLEY (coal dealer and shopkeeper at 211-214) and George ALLEN (shopkeeper at 216). The 1896 edition of Kelly's Birmingham Directory continues to list George RAMSDALE as being a shopkeeper at the 215 Icknield Street address with neighbours Henry HADLEY (coal dealer at 211-214) and Joseph UPTON (printer at 230). In the 1888 edition of Kelly's Directory of Birmingham & Suburbs the shopkeeper at 215 Icknield Street was William BECK. Mary Ann RAMSDALE (née Horton) died on Wednesday, 14 June 1899 in the General Hospital, St. George, Birmingham. Her death certificate records her cause of death as (1) ulcer of leg, (2) pyaemia and (3) exhaustion. A post mortem was carried out. Her address at time of death was Back 218, Park Road, Birmingham. Pyaemia is a type of septicaemia that leads to widespread abscesses of a metastatic nature. It is usually caused by the staphylococcus bacteria by pus-forming organisms in the blood. Apart from the distinctive abscesses, pyaemia exhibits the same symptoms as other forms of septicaemia and was almost universally fatal before the introduction of antibiotics. George Samuel RAMSDALE died on Tuesday, 23 August 1938 (age 78) at 81 Alexandra Road, Soho, Birmingham. His cause of death was certified as (1) coronary thrombosis, and (2) arterio sclerosis and he was described as a "retired newsvendor". George Frederick's condition and occupation were, respectively, bachelor and Private 36796, 12th Battalion, D Company, Devonshire Regiment. The marriage certificate stated Fanny's age to be 42 and her condition and occupation were recorded respectively, as "widow" and "Dairy Company's Kitchen Hand". Fanny PULLEN's father's name was John THORNTON (deceased) whose occupation was "Gardener's Labourer". Since her surname (PULLEN) differs to that of her father (THORNTON) it is clear that she retained her deceased husband's surname (PULLEN). The two witnesses to the marriage were M. SILVER and Ann PERRY (illiterate). on a date unknown between Sunday, 2 April 1911 (the date of the 1911 census) and Tuesday, 31 October 1916 (the date of marriage of Fanny PULLEN and George Frederick RAMSDALE) George Henry PULLEN died. Presumably, following this marriage the two children of Fanny and George Henry PULLEN lived with their mother and her new husband George Frederick RAMSDALE. As appears from the certificate of death of Fanny PULLEN, her son Sidney George PULLEN retained his natural father's surname. Fanny PULLEN died of carcinoma of sigmoid at 4 Back Street, Lennox Street, Birmingham on Wednesday, 19 February 1936. The informant was S. G. Pullen (Sidney George PULLEN), son, living at 2 Back 107, Berners Street, Lozells, Birmingham. George Frederick RAMSDALE died in The General Hospital, Birmingham of cerebral thrombosis (post mortem) on Saturday, 25 April 1942. On his death certificate his occupation is recorded as "house carter … of no fixed abode". The informant was W. F. Bates, his step daughter (presumably the married name of Winifred Fanny PULLEN), of 375 Farm Street, Birmingham 19. His age stated on the death certificate was "61" which is incorrect (he was 55 years of age but 61 was consistent with his age (35) stated on the marriage certificate). The GRO Birth Registers have only one George Frederick Ramsdale born in England and Wales between 1870 and 1890 - if correct (unlikely), George Frederick RAMSDALE was born in 1881 for which there is no official birth or baptism record. George Frederick RAMSDALE was actually born on Wednesday, 23 February 1887 and was 55 when he died. One explanation is that "1881" and "1887" look similar if handwritten. Caroline Emily (Sissie) RAMSDALE was born on Sunday, 10 February 1889 at 2 Great Western Terrace, Icknield Street, Birmingham. Caroline Emily RAMSDALE (age 22) was residing at the home of her aunt, Emily Eliza WYATT (née Emma Eliza RAMSDALE age 37), at the time of the 1911 census. Caroline Emily married Emmanuel DYSON in St James Parish Church, Handsworth, Staffordshire on Saturday, 31 May 1924. Caroline's age was 35 and her condition and residence were spinster (no occupation) of 81 Alexandra Road whilst Emmanuel resided at 11 Alexandra Avenue, Alexandra Road. He was 30 years of age having been born on Saturday, 6 October 1894 at Ombursley, Worcestershire and his condition and occupation were, respectively, bachelor and tram conductor. His father's name was Richard Andrew DYSON (labourer). Caroline's father's name and occupation were stated to be "George Ramsdale" and "newsagent". The two witnesses were Charles Samuel RAMSDALE and Edith May DYSON. Caroline Emily DYSON (née RAMSDALE) died on Thursday, 14 January 1943 aged 52 at 77 Dudley Road (her residence being 81 Alexandra Road, Birmingham 21) and Emmanuel DYSON, also of 81 Alexandra Road, Birmingham 21 a "Corporation Omnibus Conductor (retired)" died at 48 Lyndon, West Bromwich on Saturday, 20 July 1974 age 80. The informant was his daughter, Joan MILLERCHIP, of 21 Hylda Road, Handsworth, Birmingham B20. The cause of his death was recorded as carcinoma of head and pancreas. Charles Samuel Ramsdale was born on Friday, 17 July 1891 at 215 Icknield Street, Birmingham. Charles Samuel RAMSDALE married Millicent Anne ASHBOLT (born Tuesday, 26 September 1893 in Burton) by licence in St James Parish Church, Handsworth, Staffordshire on Wednesday, 5 December 1917. Charles' age was 26 and his condition and occupation were, respectively, bachelor and "Fitter". His residence was Central Workshops, Tank Corps, British Expeditionary Force, France. Charles' father's name and occupation were given as George Samuel RAMSDALE "labourer". Millicent was 24 years of age, no occupation, of 117 Queens Head Road. Her father was Martin ASHBOLT ("watchman"). The four witnesses to the marriage were (1) James WYATT, (2) Henry Walter HOWES, (3) Jessie Greaves ASHBOLT and (4) Caroline Emily RAMSDALE. Charles Samuel RAMSDALE died on Wednesday, 8 March 1972 at 3 Conway Close, Shirley, Solihull of (1) coronary thrombosis (2) coronary arteriosclerosis and (3) chronic bronchitis. Millicent Anne RAMSDALE (née ASHBOLT) died at Swallows Meadow Home, Shirley, Solihull, West Midlands age 87 on Tuesday, 23 December 1980. The causes of death were (1a) cerebral thrombosis and (b) generalised arteriosclerosis. Her usual address was Swallows Meadow Home and the informant was Jessie Dorothy HINDE, daughter of Millicent, of 15 Highters Road, Birmingham 14. William James RAMSDALE was born on Thursday, 21 September 1893 above the shop at 215 Icknield Street, Hockley, Birmingham. 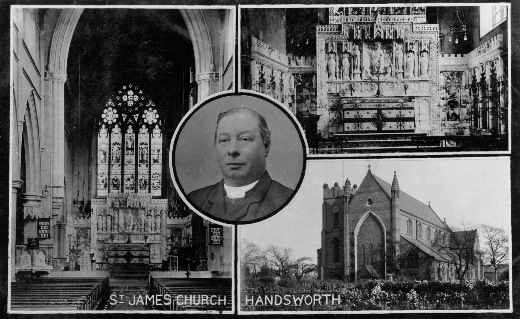 William James RAMSDALE married Elsie MASON in St Silas Parish Church, Lozells, Birmingham on Sunday, 31 July 1921 in the presence of George A (her only brother) and Nellie MASON (her younger twin sister). Elsie MASON was born at 10am on Sunday, 27 September 1896 at Back 116, Heaton Street, Birmingham. At the time of their marriage William resided at 81 Alexandra Road, Handsworth, Birmingham. Elsie RAMSDALE (née MASON) died in the East Birmingham Hospital, Bordsley Green, Birmingham on Saturday, 15 May 1975. Her cause of death was (1) bronchopneumonia due to recumbency following fractured left femur, (2) fall at home, (3) accidental death: "Certificate received from G. Billington, Coroner for Birmingham District. Inquest held 19 May 1975." William died in Birmingham on Saturday, 16 January 1982. Their last home was 46 Sheppey Drive, Chelmsley Wood, West Midlands. Sidney Joseph RAMSDALE was born on Saturday, 17 April 1897 at 215 Icknield Street, Birmingham. The informant is described on the certificate of birth as Mary Ann RAMSDALE (née HORTON), mother, of Back 218 Park Road. 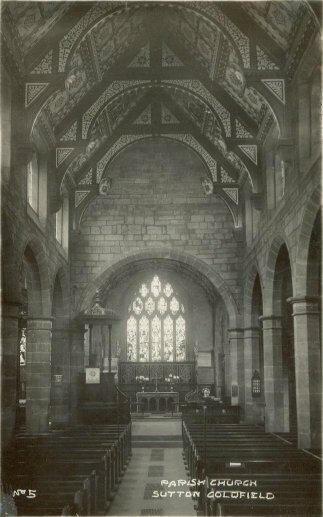 Sidney Joseph RAMSDALE married Dorothy Mary DONOGHUE WYATT (born Tuesday, 17 May 1898) in St James Parish Church, Handsworth, Staffordshire on Saturday, 6 September 1924. Sidney Joseph's age, condition and occupation were, respectively, 26, bachelor and "press worker" and his residence was 81 Alexandra Road. His father's name and occupation were George Samuel RAMSDALE and "news vendor". Dorothy's condition, occupation and residence were stated to be spinster (no occupation) and 12 Milestone Lane. Her father's name and occupation are stated to be James WYATT "motorman". James WYATT and Ellen HARRIS witnessed the marriage. Kelly's Directory of Birmingham & Suburbs (1939, 1943 and 1950 editions) lists Sidney's address as 92 Teddington Grove, Perry Barr 22. Sidney died at 92 Teddington Grove, Birmingham 22 on Sunday, 19 November 1967 of (1) general carcinomatosis and (2) carcinoma of the pancreas. His widow, Dorothy Mary RAMSDALE (formerly WYATT née DONOGHUE), is listed as still residing at this address in Kelly's Directory of Birmingham & Suburbs (1971-2). Dorothy Mary RAMSDALE (formerly WYATT née DONOGHUE), widow of Sidney Joseph RAMSDALE, (retired security guard), died on Wednesday, 17 July 1991 age 93 at Dudley Road Hospital, Winson Green, Birmingham. Her usual address was 92 Teddington Grove, Birmingham 42. The causes of death were (1a) septicaemia, (b) gangrene of right leg and (c) peripheral vascular disease. The informant was Ian James HOPPER, grandson of Dorothy. 10 Do you now belong to the Army, the Marines, the Militia, the Militia Reserve, the Territorial Force, the Royal Navy, the Army Reserve (Regular or Special), or any Naval Reserve Force ? If so, to what Corps ? Yes, "4th Bn So Stafford Reg & Reserves"
15 For what Corps are you willing to be enlisted, or are you willing to be enlisted for General Service ? "South Stafford Reg"
18 Did you receive a Notice, and do you understand its meaning, and who gave it to you ? "Yes, Sgt A Share of 3 S. S. Rgt"
(a) For the term of twelve years, for the first seven years in Army Service and for the remaining five years in the Army Reserve. 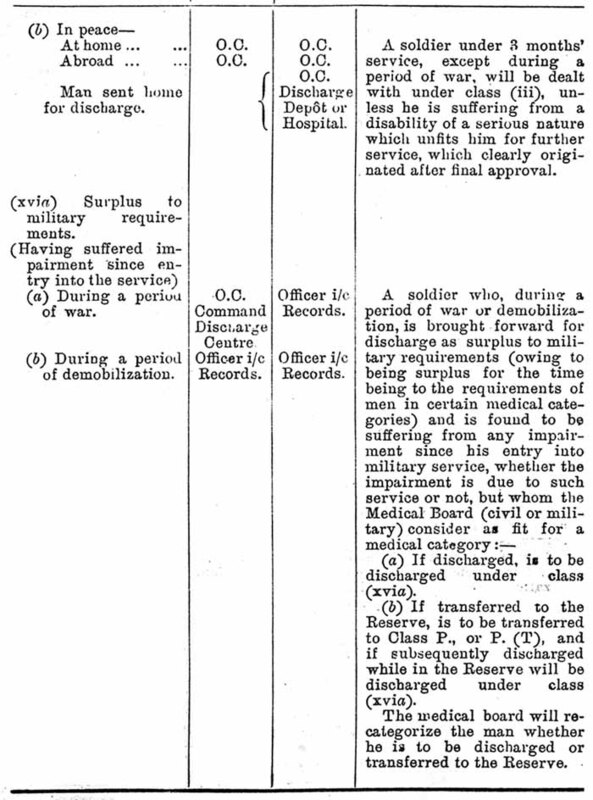 If at the termination of such period of Army Service you are serving beyond the seas then for a further period in Army Service of one year, or such lesser period as may be determined after which you will be sent home with all convenient speed to complete the remaining portion of such period of 12 years in the Army Reserve. 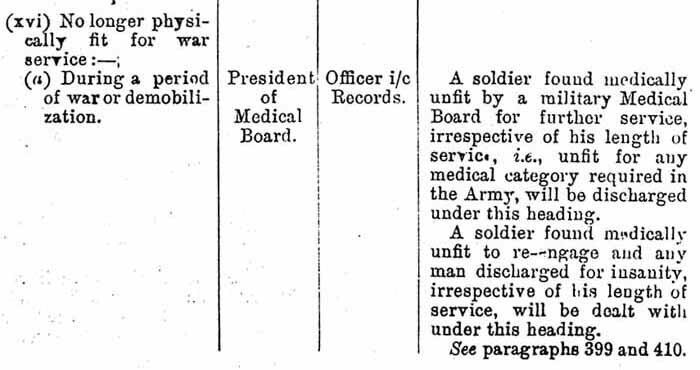 (b) If, at the expiration of the above-mentioned term of Army Service a state of War exists, then, if so directed by the Competent Military Authority, to serve in Army Services for a further period not exceeding 12 months. (c) If, at the expiration of the above-mentioned term of Army Service, you are so required by a Proclamation from His Majesty in case of incumbent national danger or great emergency, then to serve in Army Services so as to complete your term of 12 years and for a further period not exceeding 12 months. The answer to question 4 gives the age of George Frederick RAMSDALE as 18 years and 4 months i.e. a date of birth of circa August 1891, notwithstanding that he is believed to have been born on Sunday, 23 January 1887 (i.e. his actual age was 22 years 11 months and 14 days). "England and Wales Birth Registration Index, 1837-2008," database, FamilySearch (https://familysearch.org/ark:/61903/1:1:2X56-VTF: 1 October 2014), George Frederick Ramsdale, 1887; from "England & Wales Births, 1837-2006," database, findmypast (http://www.findmypast.com: 2012); citing Birth Registration, Birmingham, Warwickshire, England, citing General Register Office, Southport, England.